Are we witnessing a changing of the guard at WKRC-TV? Veteran news reporter Larry Davis retired from Channel 12 today, the third long-time newsroom employee to go in five months. Davis – who transitioned from Cincinnati radio news to TV 17 years ago – follows the exit of anchor Brad Johansen to WRAL-TV in Raleigh, NC, in February, and the retirement of 44-year reporter Deb Dixon in May. Davis started at Channel 12 in 2001 as a news writer. He worked on the assignment desk and as a field producer before debuting as an on-air reporter in summer of 2003. For much of the past 15 years, he covered Butler and Warren counties. Channel 12 reporter Joe Webb called Davis a "great guy (and) beloved coworker" on Twitter Thursday. Davis told me he decided to retire a year earlier than planned after getting two heart stents earlier this month. "I decided for health concerns that it was time to step away from the stress," he said. 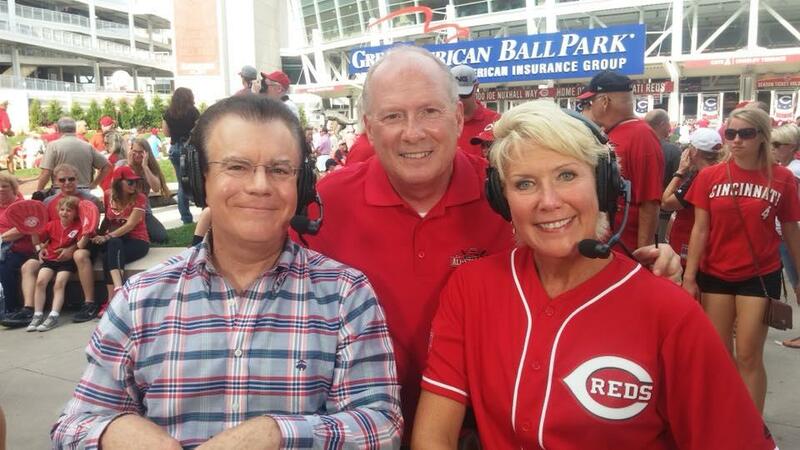 Larry Davis with WKRC-TV news anchors Rob Braun and Cammy Dierking at the 2015 All-Star Game. "When Lowell returned, he listened for to my tape for about 30 seconds and said, 'Can you start next week? I'm going to fire a guy tomorrow!' He wasn't going to fire him until he heard my tape. "On the following Monday, I started at the station's Warren County Bureau making $110 a week. Yes, $110 a week. I worked out of an old Army recruiting center and reported on everything from county commission meetings to obits. I worked with (newsman) Tom Borgerding, (bluegrass DJ) Moon Mullins and engineer Kevin Jordan, who is now the chief photographer at Local 12. Davis covered the Beverly Hills Supper Club fire, Larry Flynt's trial and many major stories. His favorite? "I did a feature at Thanksgiving on a turkey up in Preble County (near Eaton, OH, north of Hamilton) that was born deformed. They called him Popeye. He had one eye, and a crooked beak. The owners kept him as a house pet, with a diaper on him on all times, and he had the run of the house like a dog. It was a great story." One of his favorite memories was covering the Reds as a radio stringer, or freelancer, and getting audio from the Reds clubhouse after games. "I just loved listening to Johnny Bench and Tom Seaver telling stories," he said. Channel 12 – which has the most veteran TV reporting staff in town – also lost Rich Jaffe to retirement in 2016 and popular meteorologist Tim Hedrick to cancer earlier that year. Longtime anchor Kit Andrews left in July 2014, 18 months after Sinclair Broadcast Group acquired the station from Newport Television. Two newcomers – sports anchor Brad Steinke and news anchor Sydney Benter – left Channel 12 last year. Here's Larry's Channel 12 bio: "Larry Davis is a good example of it's never too late to start something new. After spending 28 years in radio news, he has launched a career in television. Larry came to LOCAL 12 in 2001 as a writer and was also on the assignment desk and field produced before becoming a reporter in the summer of 2003. "Larry spent a year in California writing news for an internet website. Prior to that, he spent 10 years as a news anchor and reporter at 700 WLW radio. He has been fortunate to spend the majority of his career in Cincinnati where he also was an anchor/reporter at WKRC- AM radio, 96 ROCK and WSAI-AM. "Davis attended Ohio University in Athens, Ohio, where he was a member of both the news and sports departments. Larry has two children - Matt who lives in Chicago with his wife Melinda, and Lauren resides in Columbus."